Cisseps fulvicollis is a day-flying narrow-winged tiger moth. 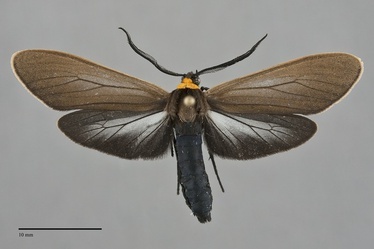 It is small to medium size (FW length 15 - 21 mm) with a relative large body for the size of its elongate wings. The head and collar are light orange. The thorax is brown gray and the abdomen is slightly metallic blue-black. The forewings are warm brownish gray and the hindwings are black peripherally and translucent pale gray-white with black veins centrally. The black antennae are bipectinate, slightly wider in males than in females. 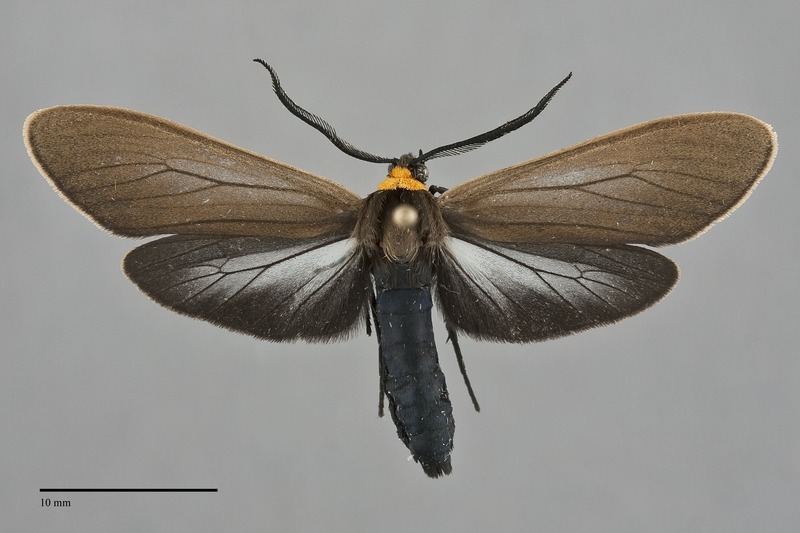 This moth resembles moths of the day-flying genus Ctenucha. 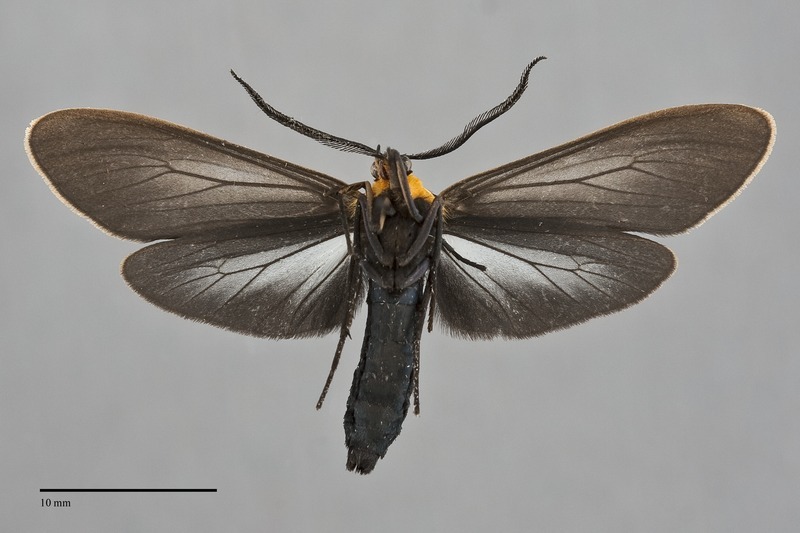 It can be told from both of the species of this genus found in or near our region by the combination of orange collar, black tegulae, and pale central hindwings. The name Cisseps packardii (Grote, 1865) has been used for specimens from the Pacific Northwest. We see no evidence for more than one species in our area and suspect that packardii is a synonym of fulvicollis. This species is common to abundant in wet meadows, old fields, and wet prairies throughout much of North America. In the Pacific Northwest, it is often found in meadows of riparian habitats along creeks. C. fulvicollis is found throughout most of our region, including west of the Cascades and in wetlands of low-elevation semi-deserts. In British Columbia it is limited to the southern Province. This species is widely distributed in North America, being found from coast to coast. Its range extends as far north as southern Northwest Territory in the west. C. fulvicollis flies throughout the summer. It is predominantly diurnal although occasional specimens come to light. Its flight is fairly slow for a moth. It nectars on flowers, especially goldenrods (Solidago spp. ).